North Carolina State University had a large quantity of diverse course offerings, which are summarized to students via a syllabus. However, a legacy of flexible policy caused an inconsistency in syllabi quality. 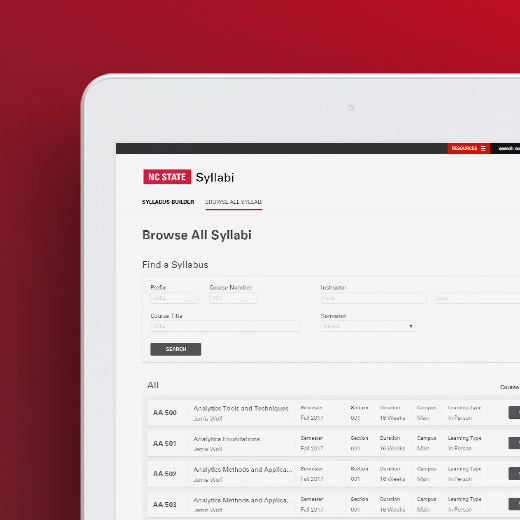 NCSU wanted to create a new application to centralize and standardize syllabus entry for faculty. The application needed to be built with flexibility for changing configurations and easily adopted by users. Atlantic BT worked closely with the NCSU development team to architect a solution. The chosen JSON-based configuration method would provide the desired flexibility and ease of configuration. Knowing that user adoption would be challenging, we performed paper prototype testing in the design phase to identify issues and improvement opportunities. Our UX and Design team created an interface for simple administration and use by faculty, with a roll out strategy shaped by previous test results.